It seems there are endless ways to throw together a pot of chili, (and we’ve tried a ton of them!) but the delicious combination of red peppers and garlic in this particular recipe spikes this one way up to the top of our favorites list. The smell alone will tempt all in the vicinity to want to sample the goods before it’s time to dig in, but patience will pay off in the end – we promise! 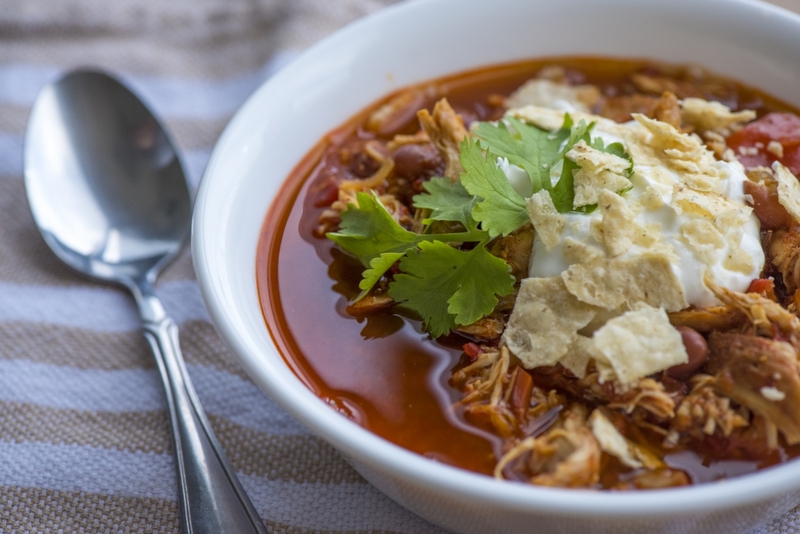 This chili is so darn tasty you’ll completely forget about how healthy and waistline-friendly it is, so don’t think twice about going back for a second helping. Sure to become a new family favorite, try it and you’ll see – dinner really doesn’t get any easier or tastier than this! Heat olive oil in a large skillet over medium-­high heat and sauté onion and pepper for 6-­8 minutes, or until softened. Add minced garlic and cook for 1 minutes, or until fragrant. Transfer veggies to the bottom of slow cooker, and top with drained beans and chicken breasts. Season generously with salt and pepper, then add chili powder, cumin and cayenne. Optional: blend together roasted red peppers and their juices until smooth. Pour over chicken breasts, along with chicken broth, then cover and cook on high for 3­-4 hours. Uncover and shred chicken with two forks.